The surveys all pointed toward the same conclusion: In the minds of most Americans, Trump was largely to blame. But public opinion may be changing. Those three polls were all conducted before Christmas, when the shutdown was just a few days old. On Wednesday, HuffPost/YouGov released a poll, conducted Dec. 28-30, during the shutdown’s second week, that showed more people disapproving of Congress’s role in the shutdown than of Trump’s. In the poll, 49 percent of Americans disapproved of Trump’s handling of the shutdown while 38 percent approved. Meanwhile, 51 percent disapproved of congressional Democrats’ handling of the shutdown and 33 percent approved. Congressional Republicans got the worst score: 58 percent disapproved of the way they’ve handled the shutdown, and just 25 percent approved. That might indicate that blame is shifting from who caused the shutdown in the first place (pretty clearly Trump, who refused to sign a bill he’d previously signaled he’d support) to who is now preventing it from being resolved (less clear). Indeed, those numbers represented a slight improvement for Trump, and a more substantial deterioration for members of Congress, compared with HuffPost’s first poll of the shutdown, conducted Dec. 22-23. But these numbers are still bad news politically for both Trump and Democrats, right? Not so fast. While Trump’s approval rating has taken a dip in the last two weeks — quite possibly related to the shutdown — it’s unlikely that any ill will over it will last until the next national election. Our analysis of polls after the 1995-1996 and 2013 shutdowns found that other news events quickly overtook them. Indeed, by just one month after the 1995-1996 and 2013 shutdowns, any changes in the polls that had occurred during the shutdowns had vanished. After the January 2018 shutdown, Trump’s approval rating recovered in two weeks, and generic-ballot polling barely budged at all. In the small sample size we have, shutdowns just don’t seem to have a long-term effect on public opinion. There’s one group of people who really hate the shutdown: government workers. According to a poll commissioned by the trade magazine Government Executive, 71 percent of federal workers oppose the shutdown, while 22 percent support it. In one of my favorite polling-related stories of the year, HuffPost surveyed modern Americans about issues that pollsters first asked as far back as 80 years ago (thanks to the Roper Center’s archive of historical polls). Some of the highlights: In 1938, just 22 percent approved of a married woman getting a job if her husband could support her; in 2018, 92 percent did. In 1978, 60 percent of people thought most members of Congress were “basically honest”; today, 15 percent do. According to Gallup, Michelle Obama is the most admired woman in America, the first time in 17 years that that title has not belonged to Hillary Clinton (she finished third this year, behind Oprah Winfrey). Obama’s husband, former President Barack Obama, was the most admired man for the 11th year in a row. Thanks to YouGov, we know the most popular New Year’s resolutions this year were to exercise more, eat healthier and save money. However, the same respondents said they weren’t so good at keeping last year’s resolutions. Just 29 percent said they kept all or most of their 2018 resolutions, while 31 percent said they kept none of them. Maybe the only thing more popular than making resolutions for yourself is making them for other people. When USA Today and Suffolk University asked voters what Congress’s New Year’s resolutions should be, 29 percent said they should work together more (including across the aisle), 15 percent said they should do their job and “fix things” and 9 percent thought they should impeach the president. It’s going to be a good year, America can feel it! Sixty percent of respondents to a Marist poll for PBS NewsHour and NPR said they are optimistic about 2019, while just 37 percent are pessimistic. Of those down on 2019, a whopping 64 percent blamed politics for their pessimism. According to FiveThirtyEight’s presidential approval tracker, 41.4 percent approve of the job Trump is doing as president, while 53.4 percent disapprove (a net approval rating of -12.0 points). At this time last week, 41.5 percent approved and 53.2 percent disapproved (a net approval rating of -11.7 points). 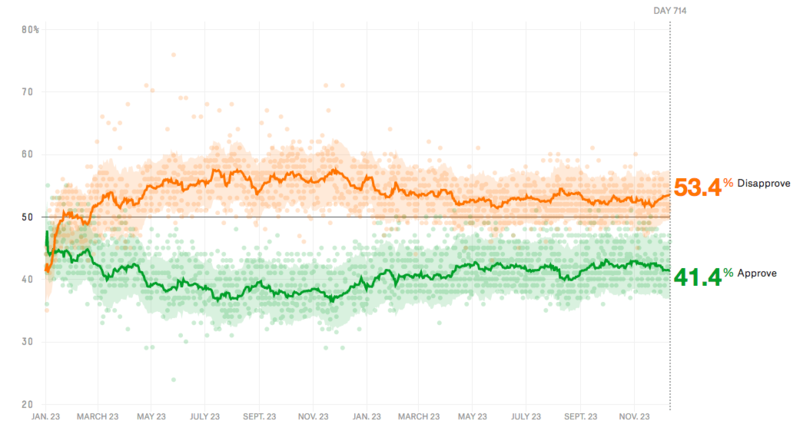 One month ago, Trump had an approval rating of 42.4 percent and a disapproval rating of 52.0 percent, for a net approval rating of -9.6 points. Will The Divisional Playoffs Restore Order To The NFL?